Are you trying to send as few emails as possible or as many as possible? Are you working out how to send less or how you can acceptably send more? Success in life is heavily related to trying. So why would email marketing be any different? The more you try and the more you do, the more results you get – as simple as that! In fact for one industry vertical analysis of 8 major brands showed the best email marketing frequency is sending 6.21 emails per week. Every email campaign generates response and revenue. Send one extra email campagin, you get extra response and revenue. And that is what you’re after, isn’t it? Sending more emails inevitably raises a concern about overloading inboxes and annoying your customers. If you believe you are annoying your customers (and that’s a big if) then the way to annoy them less is not to reduce your contact frequency but rather increase your value. After all sending poor content less frequently doesn’t make the content better and it certainly can’t generate higher response. Try running a split test of two groups and increase email marketing frequency to one group in the run up to a major promotion. Then look at the results from the two groups. You’re concerned about seeing open rates and the click rates drop? They might. But does it automatically mean you get less of what you’re after – revenue and total response? Take a look at the example above. 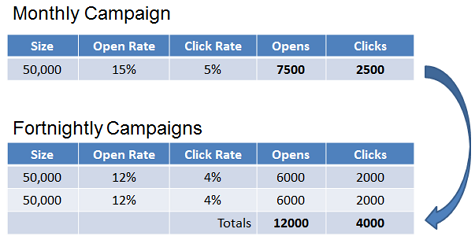 A monthly campaign sent to 50,000 people, with click rate at 5%, generates 2,500 clicks. What might happen if this was split into two campaigns? It might depress the click rate from 5% to 4%, but overall it delivers 4,000 clicks in the month. So, in terms of driving more traffic, that is more of what you want, splitting into two sends does that. And think about cadence change. Thinking about frequency doesn’t necessarily refer to sending regularly on a particular day of the week, but can also refer to changing cadence. If you’ve got a big event or promotion coming up with a cut-off point, why not experiment with increasing the volume of emails towards that cut-off point? In the days leading up to the critical cut-off point, change from your normal send pattern and add two or three emails around that point. You’ll find it gives you extra response. Ultimately you’ll only know if you’ve got your frequency set to the optimum by testing and analyzing the results. Aim to work on how you can acceptably increase volume. It may mean improving content and value but it’s a better strategy than trying to compensate for poor relevance by reducing volume. That is never a road to success.